Now you’ve seen the great pictures and are itching to add some of these special perennials to your garden beds–why not consider joining the Society for Siberian Irises. $10.00 for US citizens, $15.00 for people overseas will bring you twice yearly info. on the latest cultivars, and a connection with others who grow these lovely plants! 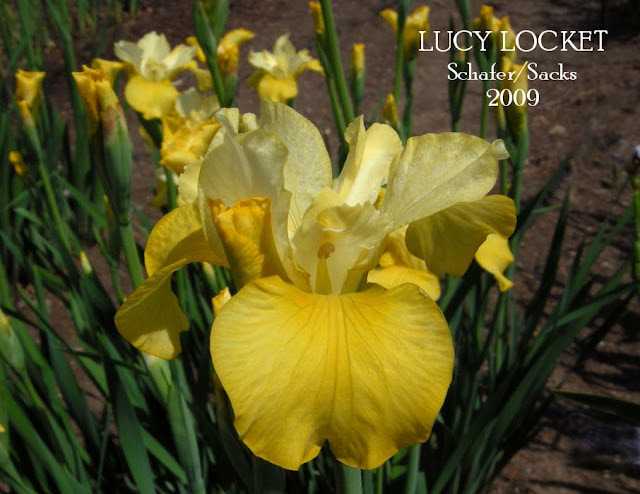 Its great to finish the Siberian Iris Feature month with what was once considered unobtainable, a Yellow Siberian and this 2009 introduction 'LUCY LOCKET,' shows the considerable advance made recently by Hybridisers in this colour tone.Congratulations to and Well done Jan and Marty. LUCY LOCKET . Schafer/Sacks (Seedling No. S01-91-10), 26", E-M. Small, sweet, golden yellow bitone flowers with lovely flaring form. Two branches with six buds and a long season of bloom. Foliage remains beautiful late in the Fall. Very vigorous. (((sib x Pleasures of May) x sib to Sarah Tiffney) x ((Star Cluster x Ruffled Velvet) x Isabelle) x (Kenbee x Alter Ego))) X Lady's Chain. Hybridisers are somewhat shy when it comes to show and tell what is in the future breeding patterns so we are really lucky when Jeff Dunlop gave his consent for me to post these brilliantly bright new seedlings of his. Jeff had this to say "As pointed out earlier 'Another Pretty Face' is not only a lovely and pleasing new tet flower but is also proving to be a parent with interesting kids too. 'Another Pretty Face' really has a lot of red in it from both parents: a nice red Dunlop seedling, 96102-3T X Strawberry Fair (Hollingworth '94). Here are just a couple of seedlings out of 'Another Pretty Face' which appear to be especially exciting. Both of these I think of as red/blues as a quick look indicates". Above is the stunning 02527-8T, a cross of a converted lavender McEwen seedling, S89/108F X Another Pretty Face. The aqua style arms with raspberry rims are especially prominent and increase the wow factor of this seedling. Nice red standards and very wide blended red/blue falls with small white signals are a special plus too. This one has been lined out and may be ready within a few years if it performs well. The second seedling is 03092-1T, a superb All American colored seedling. Falls and standards are blends of reds and blues with white signals and white wire rims. Styles have tones of light red, aqua and near white. Elements of the flower have nice width and great ruffling making for a pleasing package. This is a cross of Another Pretty Face X Miss Portland (Dunlop '06) a wonderful starchy blue with a white signal and a white wire rim. Please note that in the 2 photos, all 3 of the flowers have been crossed. The evidence is clearly seen by anthers inserted in the stigmatic lips of all 3 blossoms, to make the new cross, if the pollen takes. 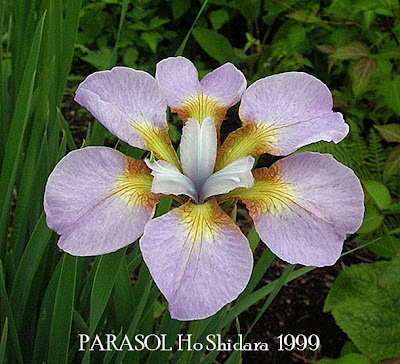 Another species look alike variety which I have gathered by page viewed statistics to date are the most popular Siberian Irises with visitors to this blog. 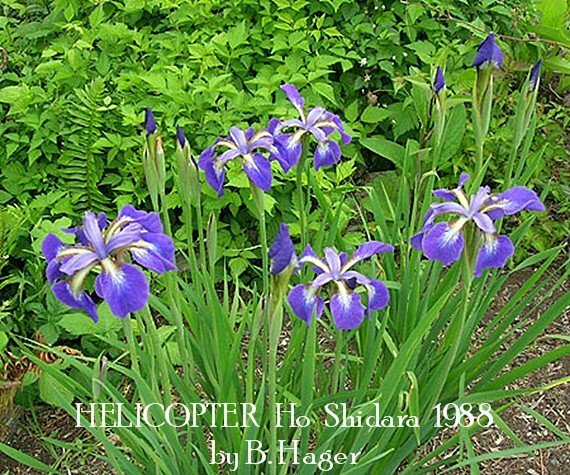 Look its really great to show the latest and greatest Siberian Iris but it would be wrong not to point out to readers that, listed within the 2009 catalogues of Siberian Irises from all growers contains some fantastic varieties with reasonable price tags . (Check out Siberian Links for a grower in your area). 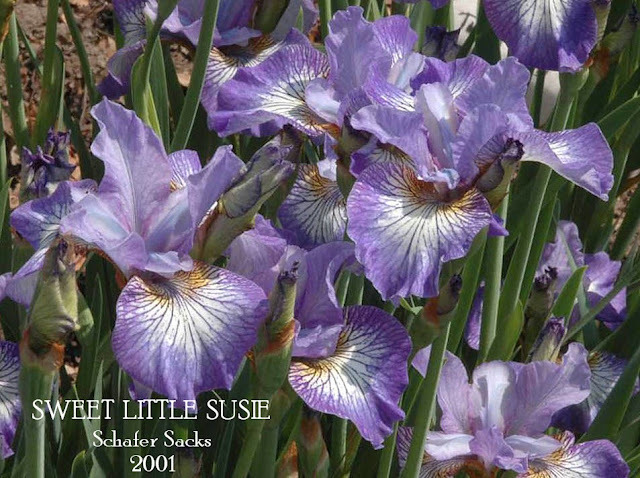 Sweet Little Susie is one of many great selections available in the six to eight dollar price range, an amazing shorter growing iris for the front of the border. So if you are new to growing Siberians or have never tried these Irises you can buy a great perennial priced for way less than a flat of Annuals. 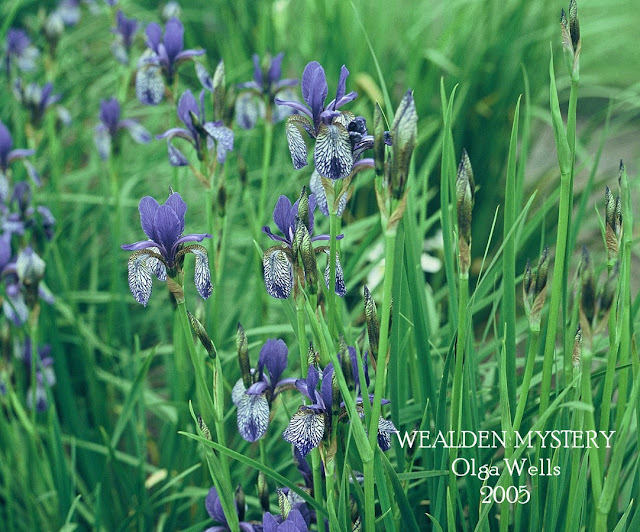 Joe Pye Weeds Garden have an great range which includes a few special priced Siberian Irises which are available for Spring shipping only, and will not be available again after that. These are marked in the catalogue with *Spring only, and all are very fine Siberians. Catalogue can be downloaded. SWEET LITTLE SUSIE - '01, EM, 22". Nice short habit makes it perfect for a smaller garden. Periwinkle blue flowers - lighter in the standards and deeper in the falls. Large cheerful white signals. 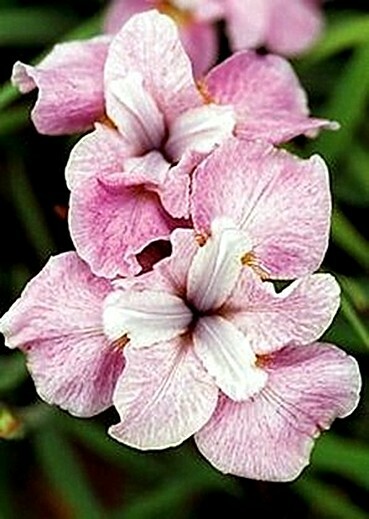 Medium to small flowers have soft ruffles and archingform. SWEET LITTLE SUSIE Schafer, Marty and Sacks, Jan Reg. 2001 Sdlg. S94-30-1 SIB (dip.) (22" 56 cm) EM. Medium hyacinth to wisteria blue (RHS 91 A, 92A) self, F. with large round white signal veined violet-blue; ruffled; slight fragrance. S90-45-2: (S86-16-1: (Percheron x Isabelle) x Sailor's Fancy) X S92-65-1: (S89-9-2: (Isabelle x Silver Illusion) x Snow Prince). Joe Pye Weed's Garden 2001. An unusual shade of lavender-blue is presented in a ruffled flower with elegant wide, overlapping form. The falls are decorated with a small white signal, veined violet, and surrounded by a bluer glow. Beautiful upright foliage and stems. 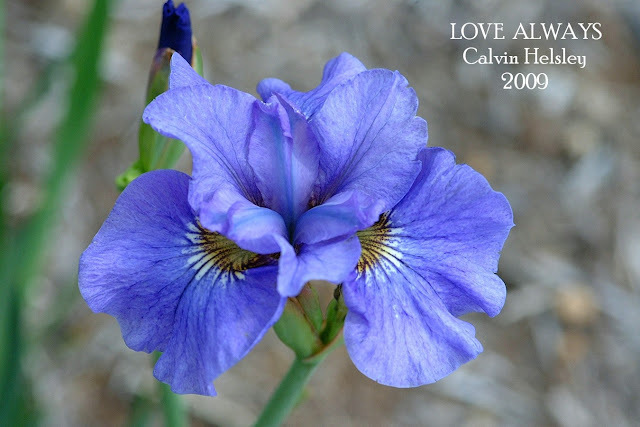 LOVE ALWAYS Calvin Helsley, Reg. 2008 Sdlg. 05-03. SIB, 35" (89 cm), M ; S. medium lavender-blue (RHS 94B) veined violet; style arms lavender blue, turquoise midrib; F. same as S., bluer area around small violet veined white signal; ruffled, flat form. Where Eagles Dare X Rosy Bows. Iris City 2009. Introduced this year by Iris City Gardens who have an very extensive catalogue of Siberian Irises with a very good price range. This website has voluntarily been taken down in protest against this law, which will be used to disconnect New Zealanders from the internet based on accusations of copyright infringement, without a trial and without evidence held up to court scrutiny. May we be very clear: we do not support or condone copyright infringement or illegal downloads. But this blatant disregard towards the basic human right to a fair trial is completely unjust and unworkable and it has the potential to punish New Zealand businesses and individuals were in fact no laws have been broken. Similar laws have been rejected in the EU as being against "a fair balance between various fundamental rights", rejected in the UK due to "impracticalities", and rejected in Germany as being 'Unfit for Germany, Unfit For Europe'. We don't care who voted for the law in the first place. We just want it stopped. We call on the Minister responsible, National's Simon Power, to do the right thing and repeal Section 92A immediately. THIS BLOG HAS BEEN BLACKED OUT FOR 24 HOURS AS OUR CONTRIBUTION TO THE PROTEST. style arms white, turquoise midrib, feathered at tip; F. bluish violet, pale blue wire edge. Sib to So Be It; seed from M. Schafer cross S97-43. Tempo Two 2005/06. More Barry Blyth Introductions just catalogue and Checklist descriptions and I'll let the photos do the talking. Fond Kiss sib; seed from M. Schafer cross S97-62-A. Tempo Two 2004/05. 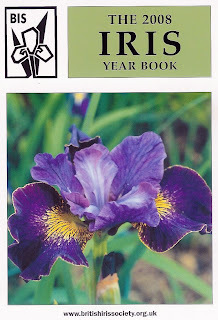 My congratulations to Jennifer Hewitt for her Dykes Medal Award for the Siberian Iris 'Peter Hewitt' which continues a proud British Iris Society tradition of awarding DM to beardless Irises. 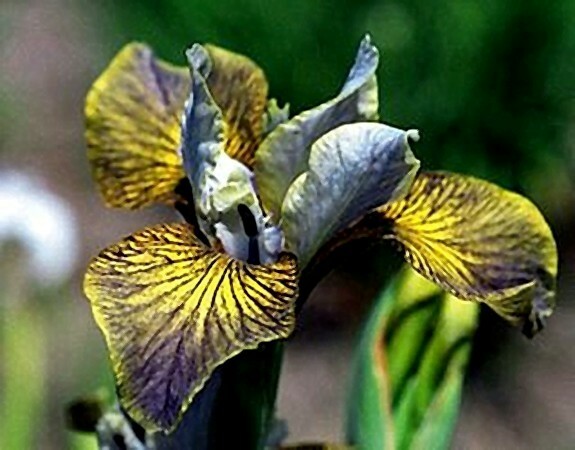 Available in England from Alden Farms who have a great catalogue of Iris. Alden Farm Catalogue 2009 Iris sibirica 'Peter Hewitt' £ 5.00 A dependable iris producing plentiful flowers and deserving its Dykes Medal. A combination of violet-blue against an eye catching deep gold signal. The falls are usually bounded by a gold edge. An attractive addition to any garden. This iris, bred by Jennifer Hewitt and named for her late husband, is the first British cultivar to receive this highest and most prestigious award since TB ‘Alexia’ in 2006 and, before that, TB ‘Darley Dale’ in 2001. Often the award is not given unless an iris is considered worthy of receiving it and ‘Peter Hewitt’ certainly is. 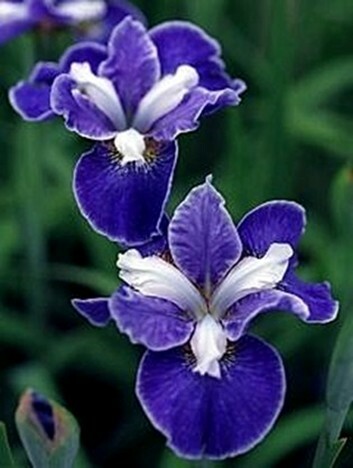 Registered in 2003 this iris blooms mid-late season at a height of 37ins (94cm). It is described as having violet blue standards, fading to wisteria blue with darker veins; turquoise style arms and falls of deep blue violet, bluer around the deep gold signal and edged gold. Its parentage is ‘Coronation Anthem’ x ‘Gold Edge’. It is probably an opportune time to note that the first ever Iris awarded a Dykes Memorial Medal was formally made at the General Meeting of the Iris Society (BIS) on November 30th 1927 to Mr Amos Perry for his hybrid between I.Chrysographes and I. Douglasiana named MARGOT HOLMES. It was a major logistical exercise to piece this post together. I offer my sincere thanks to the following people for their help, which has allowed the sharing of their information with the visitors to this blog. Jennifer Hewitt, Olga Wells, Editor BIS Yearbook, Clive Russell, Chairman BIS, Julian Browse of Seagate Irises. To Alun and Jill Whitehead of Alden Farm who have recently become the guardians for the old National Collection of Siberian Iris in England, all the very best for getting the status renewed and a Huge thanks for the Photo and information. Massive hat tip to Anne Milner for her guidance and steering me in the right direction around English Iris Circles. The Siberian Iris PARASOL, formerly known as 'HARASUGATA' clumps up well. The style will probably not appeal to traditional Siberian Iris purist, but these spectacular forms of Siberians can add novelty to the perennial border. PARASOL Shidara, Ho Reg. 1999 SIB (dip.) (30" 76 cm) S. absent; style arms white; F. light to medium lavender-pink, small yellow-green signal, multiple (6). Unknown parentage. Ensata Gardens 1997. Another extraordinary hat tip to Mike Unser for sharing the photo which is an outstanding display of this variety. Extraordinary hat tip to Mike Unser for sharing the photo which is an outstanding display of this variety. 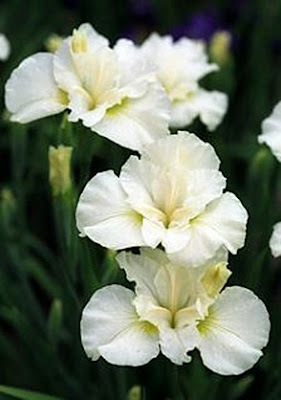 Emphasis is on form with this new white Siberian iris. Horizontally flaring, flat flowers are ruffled to the extreme! Newly opened flowers have pale yellow falls that become creamy white by the second day with yellow veining streaming from the small lemon-yellow signals. You will believe! 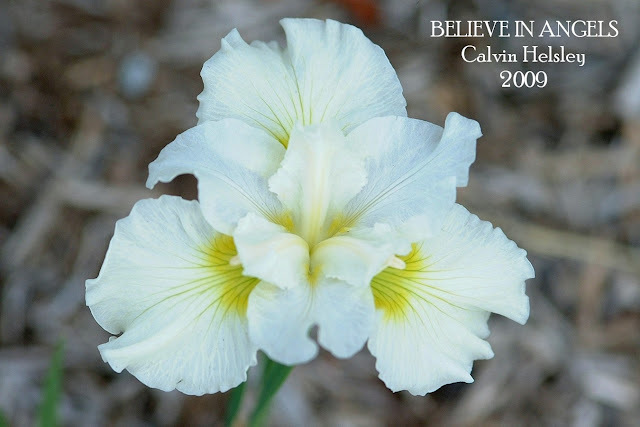 BELIEVE IN ANGELS Calvin Helsley, R. 2005 , Sdlg. 04-17. SIB, 33" (84 cm), ML ; White self, signal bright lemon yellow, some veining half way down F., all petals edged with small ruffles; flat form. Ships Are Sailing X Where Eagles Dare. Iris City 2009. 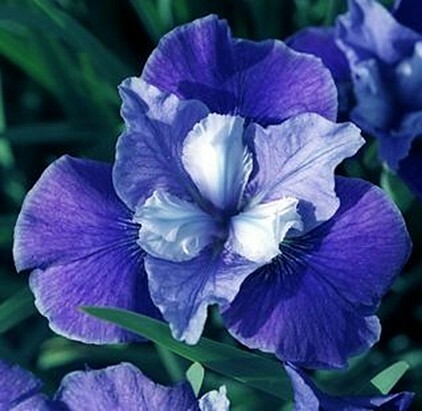 A clump of this iris will draw you from across the garden. Well branched stems have flowers of violet blue with reddish tones. The style arms are red violet with copper tinges. Very slight white signals are veined violet. Calvin Helsley has always been a hybridiser that I have admired for his talent of consistenly producing no fuss Siberians that form good clumps with copious bloom stalks. His 1984 introduction 'Mabel Coday' is still a standout Siberian in my Garden and much admired by garden visitors. 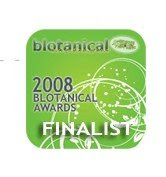 The current 2009 introductions are a continuation of a 28 year legacy and long may it continue. THEN SINGS MY SOUL Calvin Helsley, Reg. 2005 Sdlg. 05-02. SIB, 32" (81 cm), EM ; S. red violet; style arms same, copper tints; F. violet blue, reddish tints, signal white, very small, veined violet blue; rounded form. Ragtime Dance X Where Eagles Dare. Iris City 2009. 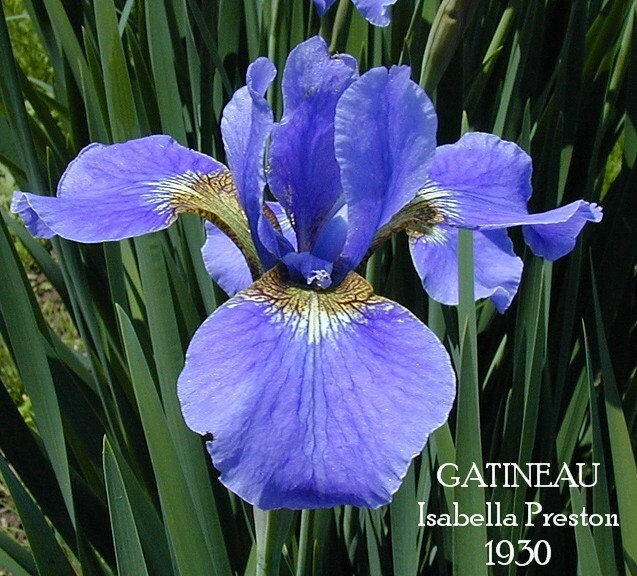 GATINEAU by Miss Isabella Preston of the Central Experimental Farm, Ottawa, Canada, was a significant advance Siberian Iris hybridising in the 192o's by Crossing Iris sibirica maxima with Snow Queen and is a good example of the Hybrid Vigour that can be achieved when crossing two inbred varieties. The more recent use of 'Snow Prince' is a similar example. Available in USA and Canada from Chuck Chapman Iris. The orientalis variety Snow Queen grows very well at the experimental Farm, Ottawa, Canada and it seemed a pity that these beautiful flowers could not be grown on longer stems. So crosses were made between Iris sibirica maxima and I. orientalis var. Snow Queen. The cross was made both ways and a number of seedlings obtained. They were all blue but varied a great deal in the shade, markings and size of flower. Several of these were named after Canadian rivers. GATINEAU is one of the best of the pale blues. Others that have been named are Abitibi, Chaudière, Kootenay, Madawaska, Ottawa, and Rideau. Two of the seedlings were crossed with the pollen of Snow Queen and one of the seedlings was named Mattawin. It is a medium shade of blue. There were some white amongst the seedlings but none was considered an improvement on Snow Queen. I am speculating but feel seed from Isabella Preston was taken to England by Lady Byng of Vimy. ( Lord Byng was the Governor General of Canada 1921-1926) I know for certain that Lady Byng exhibited Canadian introductions 'Caesar' and 'Ottawa' , at the Iris Society Show, Vincent Square, June 8th 1928. Ottawa is illustrated in "Gardeners Chronicle" of June 16th 1928. Top hat tip to Chuck Chapman for sharing another classy Historic Iris photo. 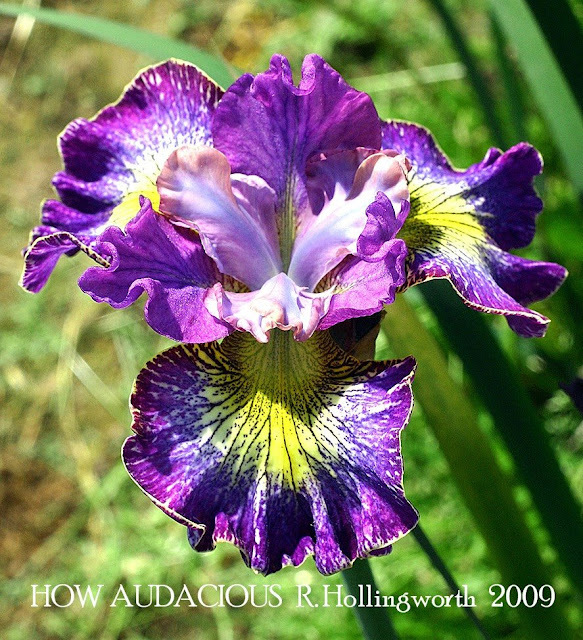 With seven Morgan Wood Medals to his name and Countless Awards of Merit and Honourable Mentions, Bob Hollingworth's 2009 Siberian Iris ' HOW AUDACIOUS' is another award winning Iris in the making. 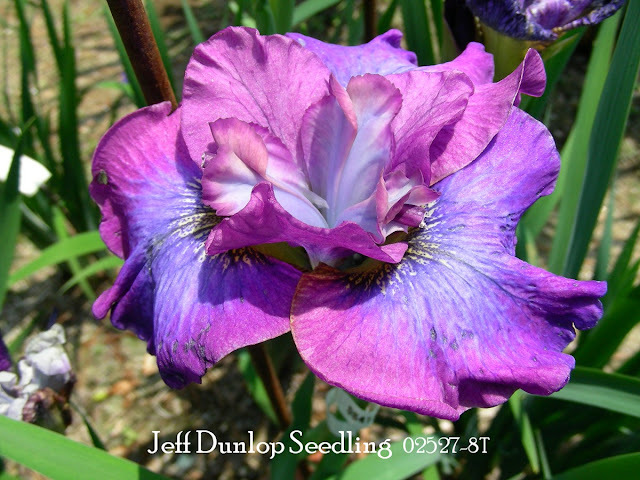 A tetraploid out of Ruffles and Flourishes and a seedling out of Currier x Bright and Beautiful. Tetraploid Siberians have features that include bigger plants, foliage and flowers. HOW AUDACIOUS Robert Hollingworth, Reg. 2009 Sdlg. 02B10B10. SIB (tet. ), 34" (86 cm), ML ; S. red violet; style arms blue violet, brown pink tips and edges; F. blue violet shading to red violet at edge, cream wire rim, cream dashes over outer petals give plicata effect, yellow signal area covers half of petal. Ruffles and Flourishes X 97B1A2, Bright and Beautiful sib. Ensata 2009. Extraordinary hat tip to Judy Hollingworth for sharing the photo which is outstanding. This is another colour advance from Jan Sacks and Marty Schafer. These smaller flowering species like Siberians are very popular when seen by Garden Visitors and after first viewing rapidly become a must have plant. SO VAN GOGH Marty Schafer/Jan Sacks, Reg. 2005 Sdlg. S97-20-10. SIB, 30" (76 cm), EM ; S. and style arms medium blue-violet (RHS 90B to 91B), darker veining and edges (89B at darkest); F. yellow (13C), lighter at edge, darkest at signal, veined blue violet (89A to 90B), darkest at tip, signal yellow, veined deep blue-violet, blends into F. Sarah Tiffney X Banish Misfortune. Joe Pye Weed 2005. HM 2008, AM 2010. 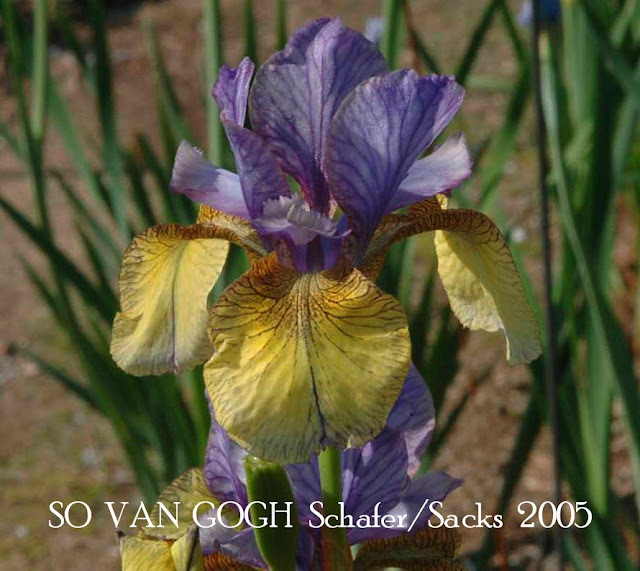 Considered to be the first 'Yellow' Siberian and possibly the most important colour break in Siberian Iris breeding at the time. 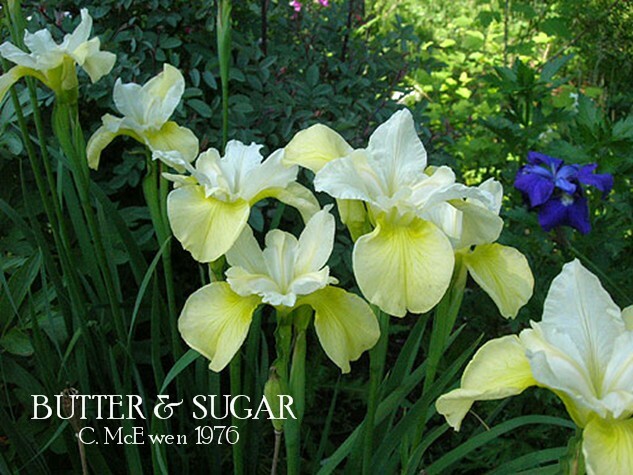 Hybridised by Currier McEwen the father of modern day Siberian Irises. Falls of bright butter yellow between neat white standards. The large, shapely flowers are carried on 70cm stems, and in our garden 'Butter and Sugar' blends in well with other plants in the perennial border. Awarded the Morgan Award and the Morgan-Wood Medal. As a 33 year old it has become a relatively new Historic Iris. Available World Wide and very reasonably priced. Check Siberian link list for a grower in your region. 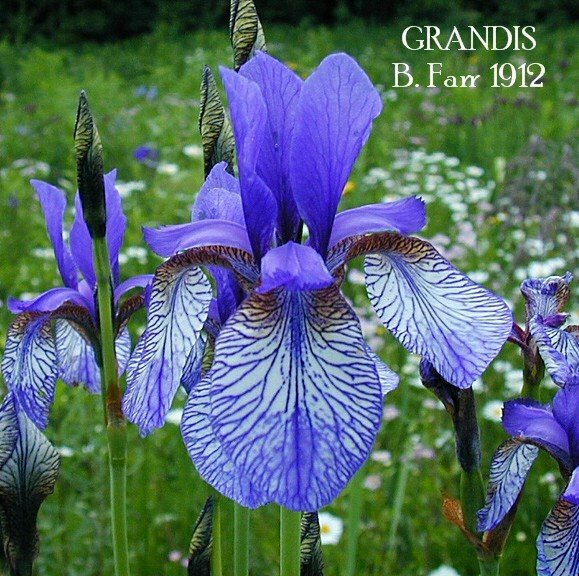 GRANDIS an Historic Siberian Iris that is just as elegant today, as the day it was introduced 97 years ago. 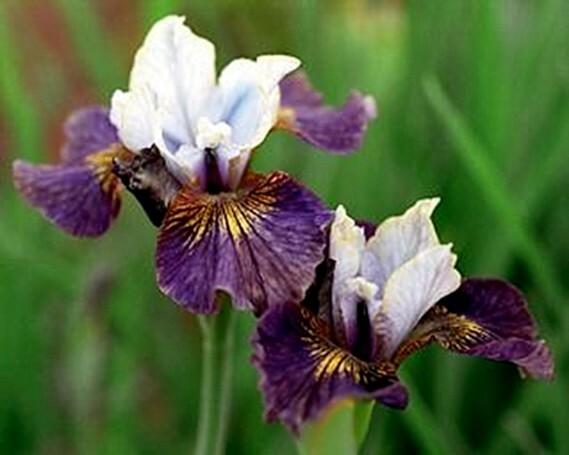 A great example of classic form.It is appropriate to feature an heirloom Siberian iris introduced by Bertrand H. Farr . 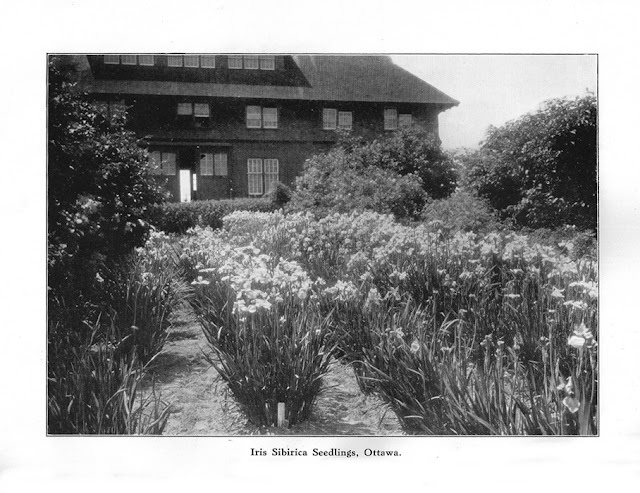 Considered to be the first person in the United States to take up seriously the breeding of Irises, his first introduction being in 1909.Indication of I. sibirica parentage are the bud pattern, height, and form. GRANDIS This variety has rich violet standards and styles with white falls beautifully veined rich violet and bronze veining at the throat. Very unusual on account of these markings on the falls which are prominent because they hang straight down Height 45 inches. GRANDIS Listed SIB (dip.) (36" 91 cm) E B3L. Blue-violet standards and style arms, white area on falls; F. reticulated with blue-violet lines that coalesce at the tips. Listed as superceded in 1939 CL. Synonyms: Sibirica Grandesse; sibirica grandis. Unknown parentage. Farr 1912. Big hat tip to Chuck Chapman for sharing the photo which is pure class. I think that this variety is Truly Amazing! PROPHET'S KISS (Blyth, 04 Aust) (24" 61 cm) EML.Standards are a soft greyed lavender with deeper veining and lemon edges. Falls are a washed brownish rose with a large gold signal. Stylearms are greyed lemon with with a deeper turquoise midrib. A long season with lots of flowers over a compact clump. 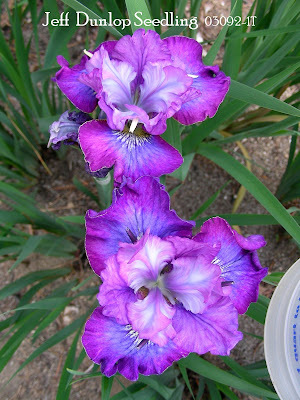 A new colour combination in Siberian Irises Sdlg. J245-1 Sib to Huntress. Seed from M. Schafer cross S97-23. PROPHET'S KISS Barry Blyth, Reg. 2004 Sdlg. J245-1. SIB, 24" (61 cm), EML ; S. greyed violet lemon; style arms grey lemon, turquoise midrib; F. brownish rose, gold signal extending 1/3 way down and heavily veined brownish rose. Seed from M. Schafer cross S97-23. Sib to Huntress. Tempo Two 2004/05. TROUBLED WATERS Barry Blyth, Reg. 2005 Sdlg. J252-5. SIB, 36" (91 cm), EM ; S. blue to blue lavender; style arms blue white hazed turquoise; F. deep blue-lavender, ¹⁄₁₆˝ edge of S. color; signal absent. Seed from M. Schafer cross S97-43. Sib to So Be It. Tempo Two 2005/06. Barry Blyth is a world class hybridizer with a half century of introduction's and has made a fantastic contribution to the Iris world which thankfully included Siberian Irises. 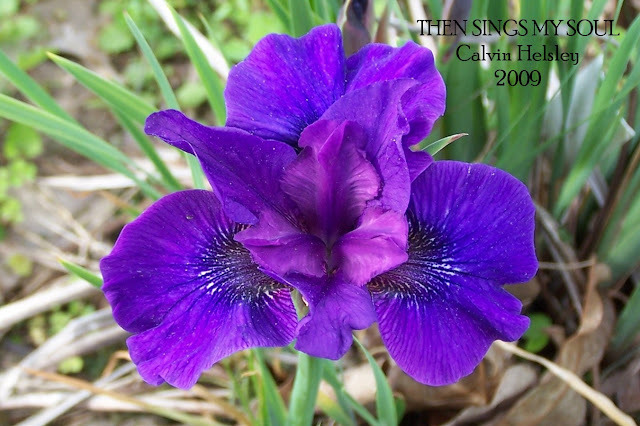 However he is not listing, selling or growing Siberian Iris any longer. Barry and his partner Lesley are cutting way back and taking it easy, and are now just concentrating on TB's. It give's me great delight to display another standout Siberian from the talented hybridizing duo, Dunlop & Cole. Introduced last season 2008 by Fieldstone Gardens Maine,USA. DREAMING OF YOU (Jeff Dunlop,R. 2007). Sdlg. 994336-1T. SIB (tet), 26" (66cm), Mid to Late. Ruffled light yellow near amoena. S. near white, slightly darker veins near center base; style arms very light yellow with darker midribs. Falls light yellow (RHS 4B) with deep yellow hafts, signal area and throat. Extravagant ruffling overall, and probably the most ruffled Siberian we know. Flower fades to very light yellow (RHS 4D) at the end of the bloom period. The first color fast yellow tetraploid with good form and great ruffling. One branch with 3-4 blooms. McEwen T9/38-1 X McEwen T9 95/94-9. 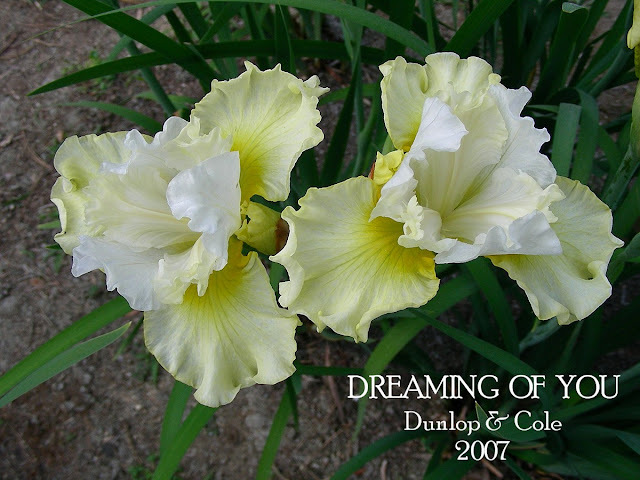 Dunlop & Cole, Fieldstone Gardens, 2008. DREAMING OF YOU Jeff Dunlop, Reg. 2007 Sdlg. 99436-1T. SIB (tet. ), 26" (66 cm), ML ; S. near white, slightly darker veins near center base; style arms very light yellow, darker midribs; F. light yellow (RHS 4B) fading to near white (4D), deep yellow hafts, signal area and throat; ruffled. McEwen T9 95/38-1 X McEwen T9 95/94-9. Fieldstone 2008.